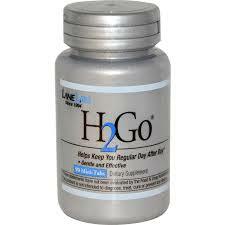 Only H2Go contains "Active Magnesia" which has up to four times the water-trapping ability of standard magnesium. For Daily Regularity: Take 6 mini-tabs with water before bed for 3 days. Reduce intake by 1 mini-tab each day, until you reach your personal comfort level of 1-2 mini-tabs daily. For Colon Cleanse: Take 6 mini-tabs with water before bed for 7 consecutive days. For Overnight Relief: Take 6 mini-tabs with water before bed. Discontinued use if stomach pain or diarrhea occurs. See a physician first if you are pregnant, breast feeding, have kidney problems or before administering to children. Store in a cool, dry place. Keep out of reach of children. Do not use if bottle seal is broken or missing.